I take a deep breath and look up at the crescent above. It’s barely even twilight and she is already shining brightly in the autumn sky. I take another breath. I feel alive, I feel whole, I feel complete and utterly content. Whenever I come back from festivals, especially one where I’ve done ritual work there is always this “energy high” that I wish I could make last forever. There is so much buzzing through my mind it is difficult to put all my thoughts in order for this post, but I will try as best I can. As I drive home from the airport I see a mass of dark shapes in the air along with that moon. In the distance I guess they may be sea gulls. I’m driving past the large river that snakes it way through Hartford I can usually see gulls here looking for food. But soon I realize they are crows. No just a few, or a dozen, or two dozen, but a sky full of them. 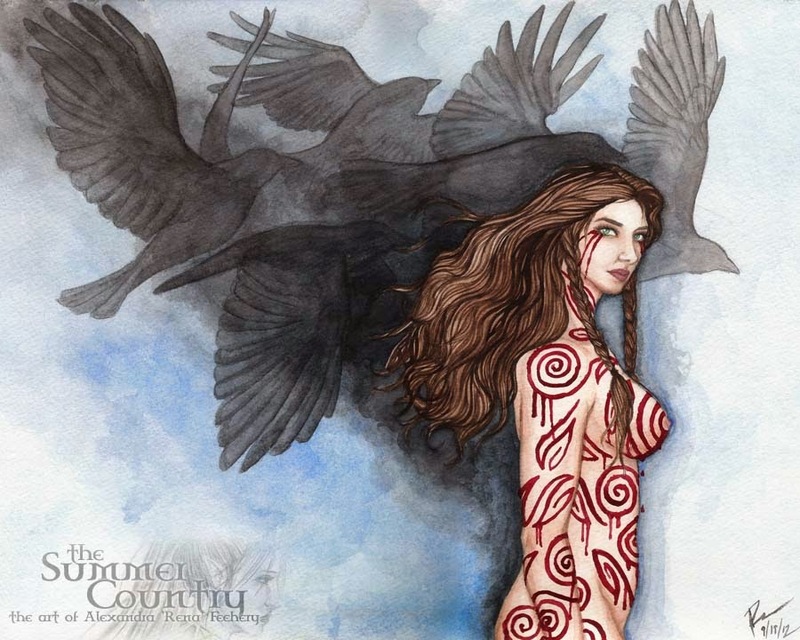 And the words of the song I am listening to come back to me, “But the bravest of souls are the Morrigan’s tithe/Hers for the taking and hers to revive/Oh the rubies the Raven collects/The rubies in the Morrigan’s nest”. It makes me think of another day, when another murder of crows, if I can even call it that, rattled something within me. (You can read about that here: http://darkgoddessmusings.blogspot.com/2013/02/a-storm-of-crows.html) But the crows flooding the sky tonight they feel content. 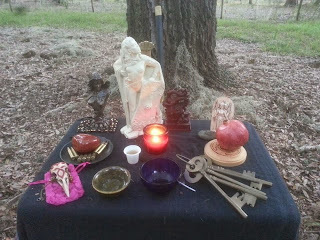 They circle around the highway as the sun sinks below the horizon, and I feel the embrace of the Morrigan filling me again, as it did in our ritual in FPG, and I feel blessed to do what little bit of Her work I can in this world. Then there is the ritual we did at FPG. In ritual, especially when you are embodying or aspecting a deity so many of the details become fuzzing afterwards. So I often try to jot down some of my thoughts and feelings afterwards. The ritual was so beautifully powerful, it left me with such an amazing feeling afterwards, and I’m riding that ritual high still. So here is what I wrote afterwards, although it doesn’t do the work we did justice. I feel feathery wings embrace me as I walk, a caress I feel in my soul and sense in my mind’s eye. Something familiar steps forward in me. I am still myself, and yet I am not. I feel taller, I want to shout, I can not stand still. As we walk to the stone, a scattering of large boulders piled together just within sight of the water, we look over to a see there are now cows in field adjacent to the ritual space. And I have to laugh, because it just makes sense. The Morrigan is always concerned with cattle in her myths, they were ultimate symbol of wealth to the Celts. They are the symbolic wealth of the land and tribe, and it is the land we have come to honor. To call upon the Morrigan as the Goddess of sovereignty, that force the Celts saw as springing from the land itself, and that force we need to learn to re-claim in ourselves today. Myself and the other women who will be calling upon different faces of the Morrigan hold hands. And I feel part of myself step back, and I become some odd mix of the Catha Badb, the Battle Crow, and myself. Sometimes aspecting a deity can feel intense, but not today, as wild as I feel inside it is a familiar feeling. A comfortable, embrace of an old friend. The very first lines of this ritual I wrote was the invocation to Badb I will say very soon. Words that I had to pull over on the side of the road to write down on my way home one day because suddenly she was there at the edge of my thoughts telling me she had something to say. Next to me the woman who will embody the Washer at the Ford begins to whisper, but it’s not her voice I hear. I can feel the moment she is gone and the Washer Woman has stepped in. And when the Washer at the Ford speaks her prophesy, I know I am listening to the words of the Morrigan. I am quiet by nature, perhaps one of the many reasons I need the Morrigan. But in this ritual I feel like I can’t shout loud enough. It is not my quiet voice that is speaking. We are calling, then shouting, the Morrigan’s name, we challenge those who have gathered and those who wish to make an oath to the Great Queen come forward. They lay their hands on my sword and I soak up each oath, each promise, each kiss of the blade, and each heartfelt vow, each shed tear. And in the back of my mind I feel Her accepting these words, accepting these oaths, drinking them in. We make offerings to the Great Queen and the ritual is done. I feel blessed, whole, complete, and thankful for kinship. The voice of the Washer at the Ford came through strongly in our FPG ritual, and makes me think of my own personal ritual to the Morrigan a week prior. This Samhain has been busy. I’ve attended so many wonderful rituals and festivals over the course of the last month, along with doing my own private devotions to the Great Queen. I feel her so strongly on Samhain, she is standing there on the knife’s edge, at the liminal time between times. While I go to other rituals for Samhain on the days leading up to it and after it, the night of Samhain itself I set aside for myself. I need that time to connect with her in a personal way. In my own ritual I called to a different face of the Morrigan as I called the four quarters. In the east she is the Battle Crow, in the south she is fiery Macha who tempers our souls as a smith does a blade, in the north she is the lady of Sovereignty, and in the west she is the Washer Woman, the queen of phantoms. I wasn’t terribly surprised that it was the Washer Woman who stepped forward so strongly in my personal ritual. The Washer at the Ford had been whispering to me for weeks. As I called to the west I could hear the sounds of the water as she washed the armor of the slain, as she washes our fears away. She stood in the shadows just outside of sight. Perhaps it was the ritual we had planned for FPG, which as we continues to plan was in the back of my mind at the time, or maybe it’s has just that this was the face of the Morrigan I needed at that moment. I could feel water rushing all around my bare feet, as if I stood in a river, ankle deep. I could see her in my mind’s eye, veiled, the water turning the deep red of rubies and wine as she moved her hands through the water. Reminding us she’ll wash away our fears, our lies, and all that is unworthy of our truest selves. I dip my hands in the water I have poured into the large bowl upon my altar. I run my wet fingers across my face, down my body. So many things to release, so many things to let go of. I let them flow into the waters, and flow into those Other waters I feel swirling around me but can not see with my physical eyes. I offer them up to the Phantom Queen, until I feel bare and cleansed, and I think there is no other way to approach the Morrigan. No other way to stand before her, except baring yourself to bone.